Mirror refers to any smooth polished or shining surface, that can reflect the light beam and form images. It can be of two types, i.e. plane mirror and a spherical mirror. The mirror whose reflecting surface is flat is a plane mirror whereas a mirror with the curved reflecting surface is termed as a spherical mirror. A spherical mirror is of two types, i.e. convex mirror and a concave mirror. A convex mirror has a reflecting surface that bulges outside. On the contrary, in a concave mirror, the reflecting surface bulges inwards. 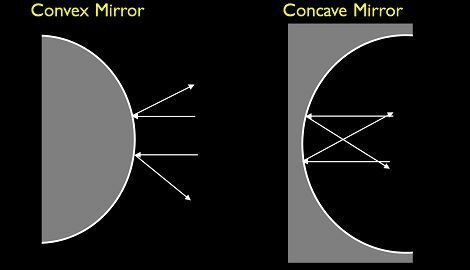 The main difference between a convex and concave mirror lies in the image formed by the two mirrors, i.e. while convex mirror forms diminished image, the concave mirror either forms an enlarged image or a diminished one, depending upon the position of the object. Meaning Convex mirror implies the mirror whose reflecting surface is away from the center of curvature. Concave mirror refers to the mirror whose reflecting surface is towards the center of curvature. Image Virtual image is formed. Real or virtual image is formed. Used as Rear view mirrors in cars and bikes. Reflectors in projectors, searchlights etc. Convex Mirror or otherwise called as a diverging mirror, as the incident ray emerging from the same source (point), will reflect off and move in a different direction. Consequently, the light rays will not intersect on the object side of the mirror and form the virtual image of the real object. It is a type of spherical mirror, wherein the reflective surface is curved outwards, i.e. the source of light. It forms a virtual image when after reflecting from the mirror, the ray of light meets at a definite point. The image formed is erect, and diminished in size, concerning the object. These mirrors are used as rearview mirrors in cars or motorbikes, ATMs, hallways of schools, hospitals, stores, etc., to help the people view, what’s happening behind them. The concave mirror is the converging mirrors, due to the fact that when parallel incident rays fall on the surface of the mirror, the rays will reflect and meet at a particular point, i.e. focal point. Its shape is identical to a spoon. 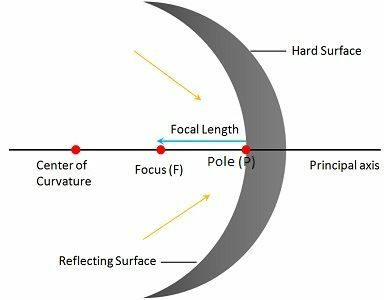 The reflecting surface of a concave mirror bent inward to focus, i.e. away from the light source. When the light is bounced by the curve up to a particular area, they form an image. When the object is closer to the mirror, the image formed will appear larger and right side up, i.e. a virtual image is formed. When the object is farther away to the mirror, the image formed will appear small, and upside down, i.e. a real image is formed. These mirrors are used as reflectors in the headlights of the cars, searchlights, projectors, etc. They are also used by dentists, or as shaving mirrors. The type of spherical mirror whose reflecting surface is bulged outwards, in the sense that its face is opposite to the centre of the sphere is known as a convex mirror. A curved mirror whose reflecting surface is bent inwards, i.e. it faces towards the centre of the sphere is called a concave mirror. The focal point of the convex mirror lies behind the mirror, wheres in the case of concave mirror the focal point lies in front of the mirror. Convex mirror is also called as a diverging mirror as the light beam arising from the same source will reflect and diverge. As against, a concave mirror is a converging mirror, as when a parallel light beam falls on the mirror, they reflect and converge at a point. The image formed by a convex mirror is a virtual image, while concave mirror forms a real or virtual image, depending on the position of the object. Convex mirrors are used as rear-view mirrors in cars, to enable the driver to see the traffic behind him. On the contrary, concave mirrors are used in torches and vehicle headlights. 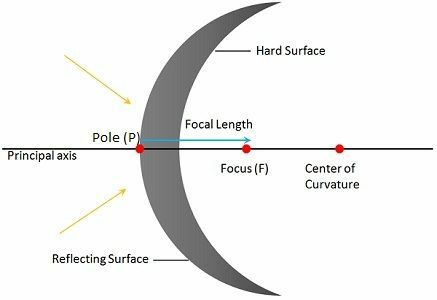 By and large, convex and concave mirrors are the two types of spherical mirrors with many uses which is not possible with a plane mirror. The two mirrors are diametrically opposite to one another and produce different images at different positions.